When Matilda says people, she mostly means guys. Male skateboarders. The dominant force in the sport/culture. 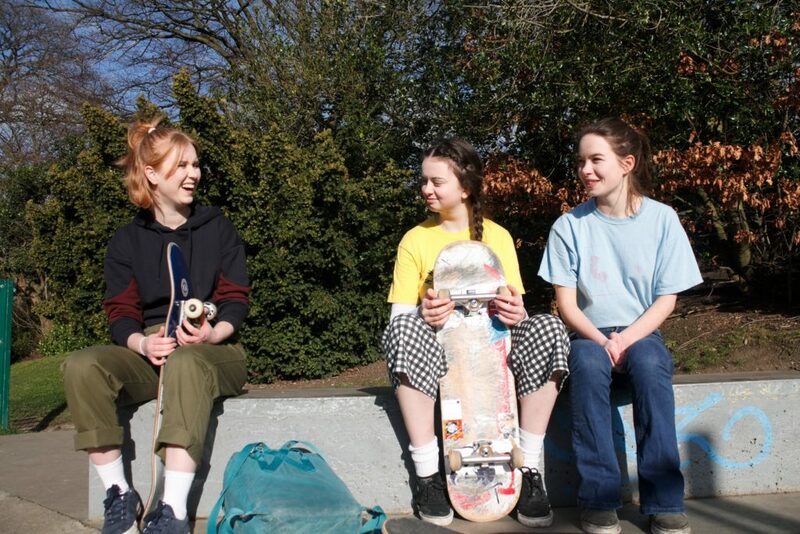 She, together with Charlie, Olivia and a few other girls, belongs to Cheapskates, a female skateboarding crew. While they’ve moved on from the early mornings at the skatepark, and have built some relationship with the guys at their local, they still avoid prime-time, and wouldn’t dream of going to certain skateparks, such as the newly opened Crystal Palace park, where they’ve jointly put together the description of a place filled with: “angry-looking skaters wearing beanies and North Face jackets,” they say laughing, adding that they know they wouldn’t feel comfortable there. Cheapskates are still in the early stages of learning, they jokingly warn me they’re “not too good” as we sit on top of the concrete ramp to have a chat, and eat some grapes, before they show me what they’ve got on the decks. When they do eventually get on their boards, they seem comfortable practising together. But that’s not often the case for a lot of female skateboarders. 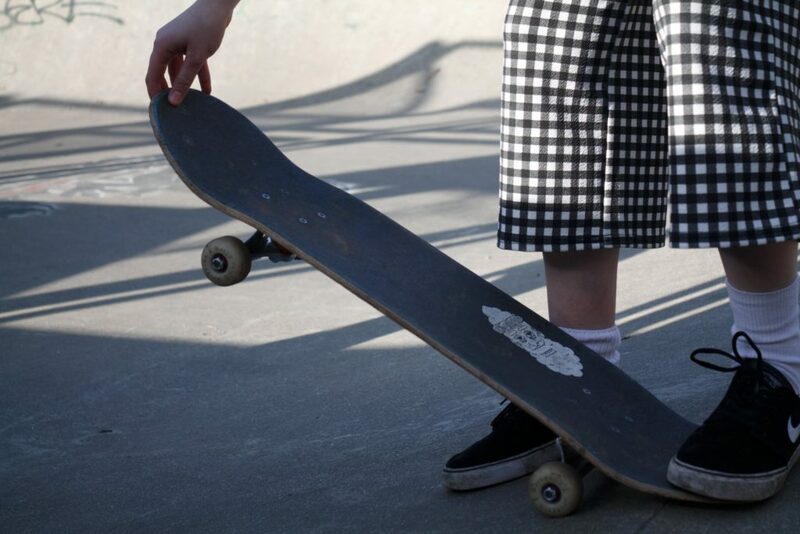 Most people in the skateboarding community will agree it’s a highly male-dominated sport. 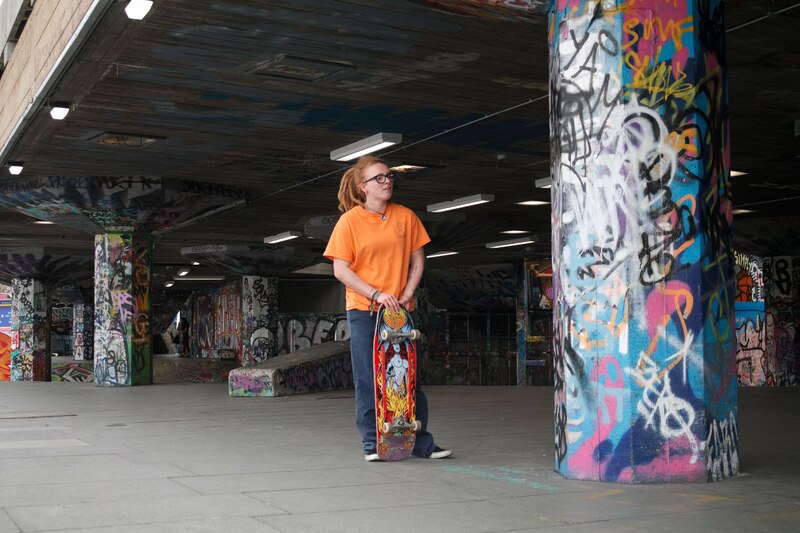 With it’s upcoming introduction to the 2020 Olympics featuring both male and female categories, it seems obvious that there are female skateboarders out there, yet one will still often struggle to catch sight of them around London’s skateparks. Why? Skateboarding first came to be in the 1950s, after surfers decided to bring their unique way of navigating water onto the streets. It was in the 80s and 90s, after the invention of VHS added the key component of filming to skateboarding culture, that the sport greatly increased its popularity. 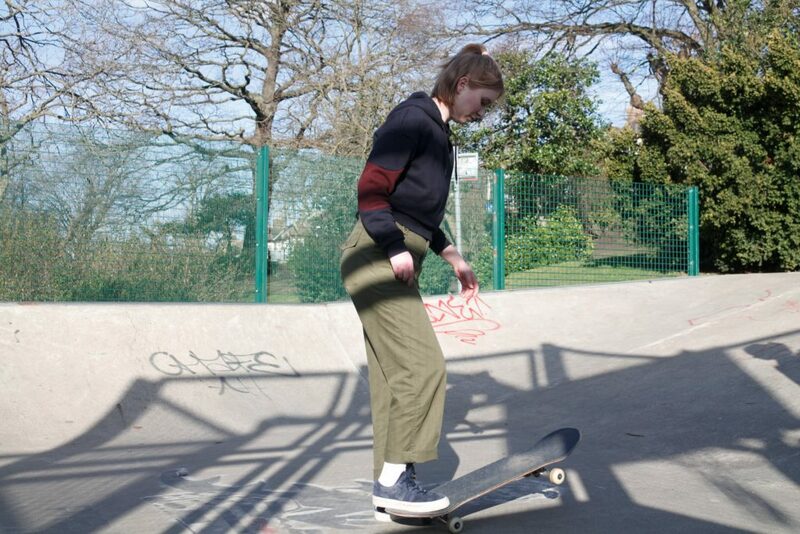 So how does the scene for female skateboarders in that era compare to that of today? Someone who knows very well is Lucy Adams. 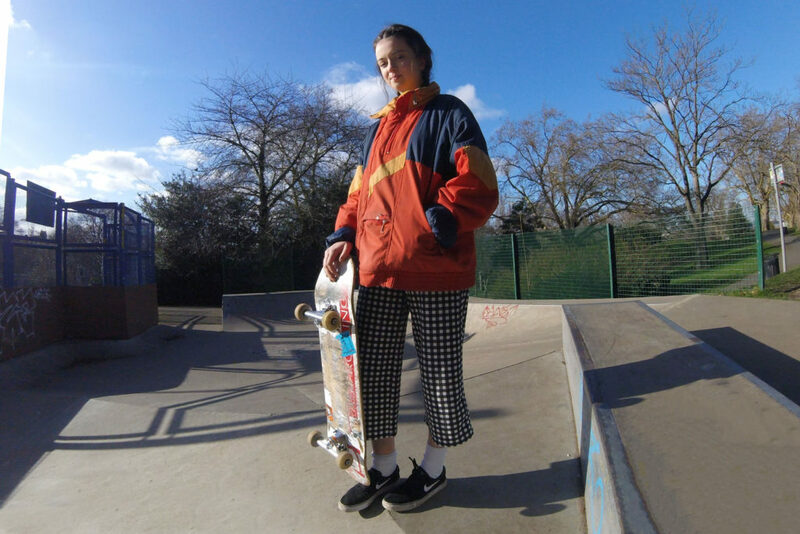 She’s one of the most influential women in skateboarding in the UK, a professional skateboarder, and three-time champion in the UK skateboarding championships, among other titles. She started skating in 1997, when she says there were a lot fewer people doing it: “If you met somebody in the street, or saw somebody in DCs or Etnies or that type of shoe, you’d feel a bond with them, and you’d kinda’ nod and make an acknowledgement,” she says. The male to female ratio seems to have shortened with this massive increase in numbers, but it’s far from reaching a balance. Professor Holly Thorpe is also an influential woman in the world of action sports, and she believes this imbalance persists today due to the beginnings of skateboarding. Holly has a PhD in women in action sport cultures and is an acting senior lecturer at the University of Waikato, New Zealand. 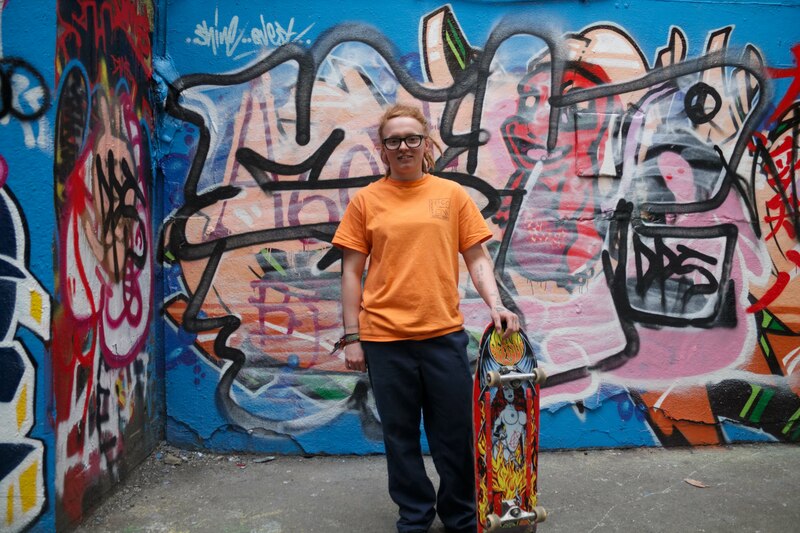 But Holly has also recently been working with the International Olympic Committee (IOC) to help them understand how to include new sports into the Olympics, such as skateboarding, in a way that is culturally appropriate, considering the unique cultural values in these sports. Holly sees a major shift in how women have been depicted in skateboarding culture through the decades too. “What we see in skateboarding culture now is no longer reliant on what we saw in the 90s, which was through two main sources: the skateboarding magazines and the videos. Those were edited and produced by men, so we saw fewer women in those and we saw them framed up in the ways men wanted to frame them. Although female skateboarders are taking matters into their own hands and representing themselves on social media, the lack of coverage and the less than equal way women are often depicted in mainstream skateboarding culture stand out. Take Thrasher. Even if you don’t skate or know anything about it, chances are you’ve heard of the magazine and brand. Thrasher started as a skateboarding magazine and is now one of the most influential and mainstream skating clothing brands, with many non-skateboarders wearing branded t-shirts and hoodies as a fashion statement. Yet Thrasher doesn’t exactly give a lot of representation to women skateboarders. The first woman to appear on a Thrasher Magazine cover was Cara-Beth Burnside, in 1989, eight years after the magazine was first published. Since then, women’s faces on Thrasher covers have been scarce. 2017 saw Lizzie Armanto as the only woman for the whole year’s covers on May’s issue. No women in 2016. There are less female skateboarders than men, so it’s understandable that there would be fewer women featured, but the representation is practically non-existent. The brand has, however, featured women as part of one of their t-shirt designs. Thrasher first came out with the “Oh God! 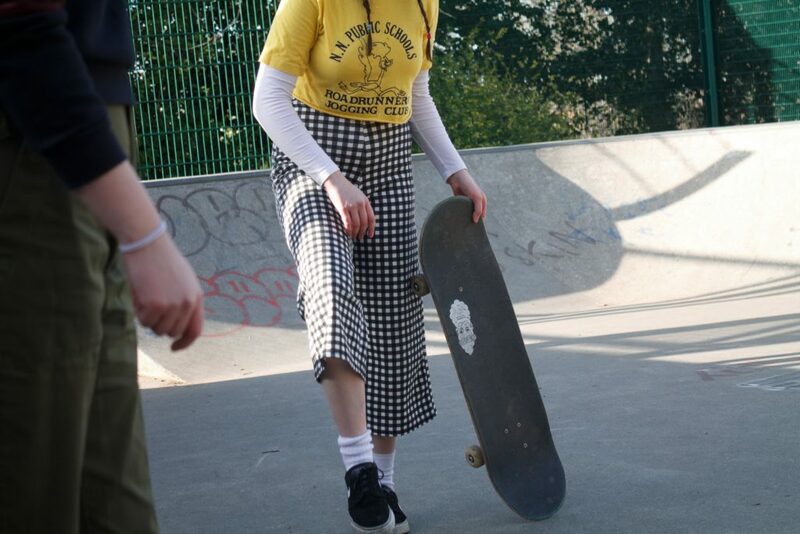 Why can’t my boyfriend skate? !” t-shirts 24 years ago. 297 issues later, according to Thrasher, this has become the longest-running t-shirt design of the brand, without counting the magazine logo t-shirt itself. So what is the problem with a slogan like this? Artist Robin Eisenberg was commissioned by Thrasher to do the re-make illustration pictured above of the original t-shirt design, but says she never intended for it to be a pushback for female skaters. Thrasher were contacted but did not comment. 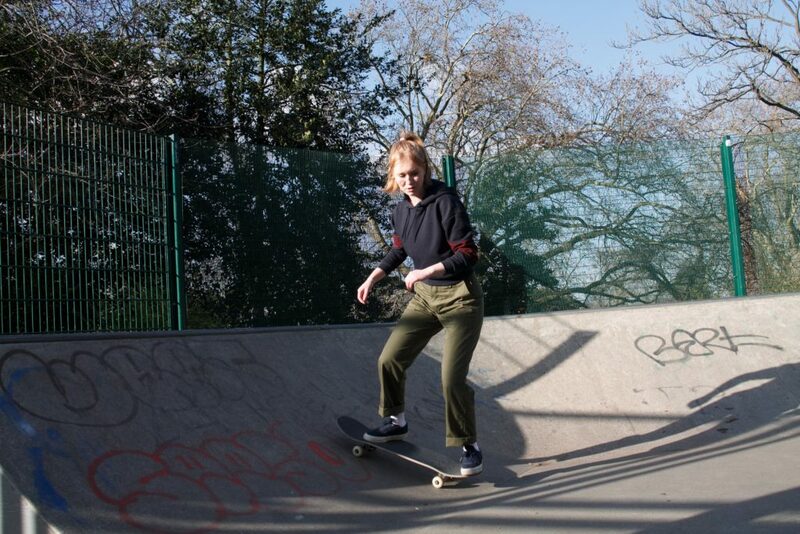 For Holly, the representation problem of women in skateboarding is tied in with over-sexualisation, “that stuff has been around for so long. 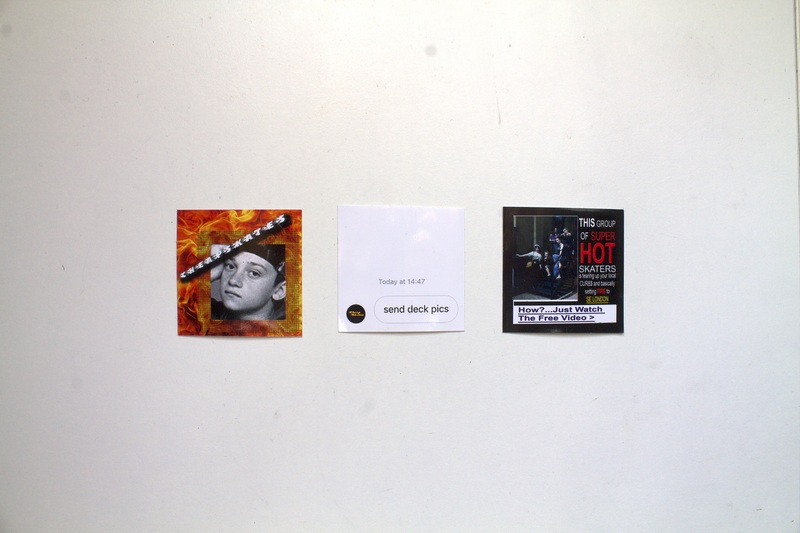 Naked girls on the bottom of skateboards, those kinds of graphics… Skateboarding has always been a space for young, patriarchal, masculinity, where the homosocial relationships between young men often require the excluding or marginalisation of other men who don’t fit into their type of grouping, and often, women,” she says. This shift is resonating at the skateparks. In London, Girl-Only nights have been sprouting up around some of the capital’s most notorious parks, Bay Sixty6 and House of Vans. 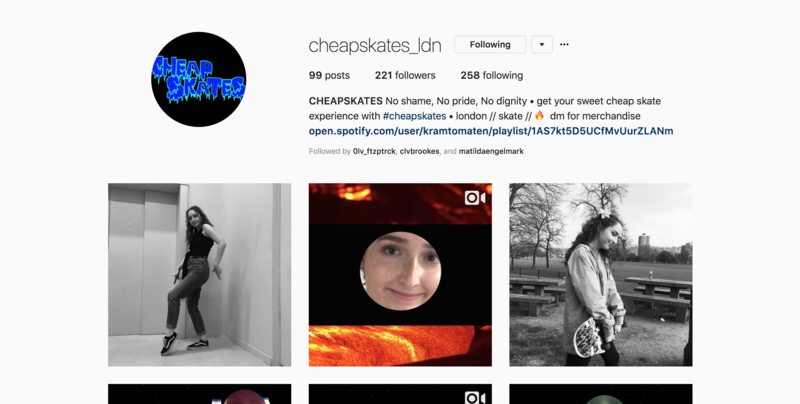 Cheapskates head to the monthly Girls’ Night at House of Vans in Waterloo, where they’ve been hosting these events for the past three years. The house is flooded with girls all ages and the DJs are blasting female anthems that echo through the re-purposed tunnels of the skatepark. Cheapskates seem a bit uncomfortable at first, the ramps are busy to the point where there’s almost no space to skate. They eventually find their space and start practising a trick. 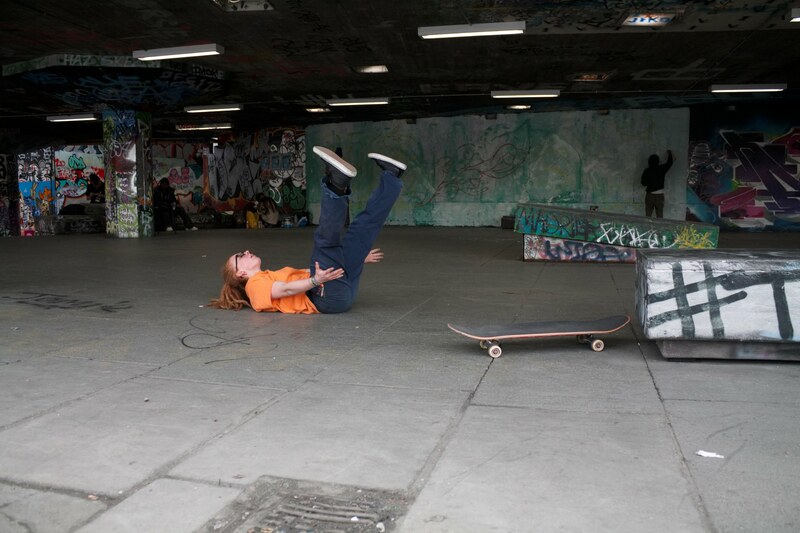 From a local perspective, Jorge, who continually skates around London’s parks says: “They do a lot of all-girl sessions in skateparks now. I understand that for a lot of girls if there’s only guys around in the skatepark it’s a bit intimidating, due to what you can hear and what guys have said in the past. So it’s nice to encourage certain girls to go there and get confident.” Though he adds that he worries that “girls might only get comfortable when skating with girls”. The difference in numbers when comparing female skateboarders’ presence at the skatepark and at Girls’ Nights is quite dramatic. Below is an representation of the number of female skateboarders observed at Southbank skatepark on five different days, at different times, over a two-month period; the numbers amounted to four female skateboarders, as opposed to 38 males, making 90.7% of the space at the skatepark male-dominated. On the same time period, just a few blocks away, the Girls Night event at House of Vans saw a turnout of 350 female skateboarders in just one evening. 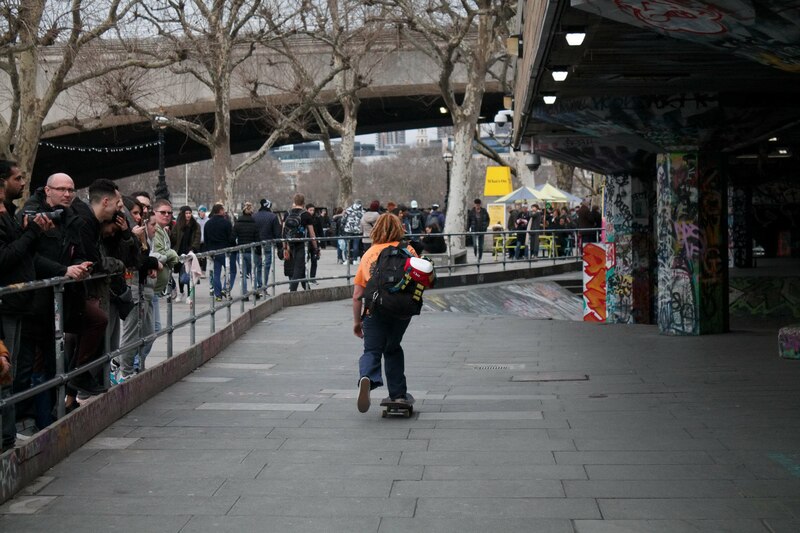 Female skateboarders might be missing from the streets, but they’re certainly still there. But how do these events themselves play into gender segregation in skateboarding competitions? So could these girl-only events at the skatepark be harming female space on elite competitions? “I think it’s not an either-or situation,” says Holly. “People like Mimi Knoop, she’s been a top female skater in the US for many years and a few years ago set up the Women’s Skate Allegiance, and has been pushing really hard with a clique of female skaters to make sure women have space in those events. 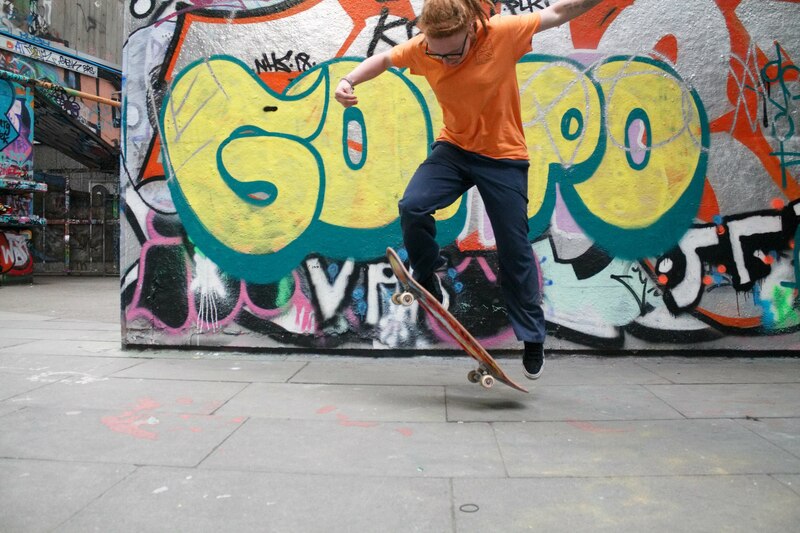 So what is the solution for skateboarding to become a more inclusive sport? “I think that’s where the uncomfortable feeling comes from, in knowing you’re sort of alien in the space and you don’t really feel like you should or can belong there,” says Olivia. Holly explains how she sees the skating culture changing for female skaters. “In skating cultures,” Holly continues, “in the small town where I grew up, I looked around and I didn’t see any other girls skating, so I felt like it wasn’t a thing girls could do. Now, little girls growing up in towns across the world might not see girls around skating, but they can flick on YouTube and see that there are other amazing girls skating all around the world, so they don’t feel alone and they can get that inspiration. We’ll have to wait and see if the Olympic Games do have a large impact on increasing the numbers and presence of female skateboarders. Until then, hopefully, the efforts being made in the skating community to invite more girls to join in and be visible will continue to increase, so that female skaters will no longer be missing from any skatepark. I like wht you guys tend to be up too. This kind of cllever wor and reporting!